No, seriously, I did. I looked it up in my Ravelry notebook (I never miss a chance to put in a new project there, so it’s not like I missed one) and I have not completed a project since March. Maaaaarch. That, more than anything else, is a true measure of how completely wiped out I have been. At any rate, I crocheted something this weekend. Anyway, Julie asked me what I would charge to make one for her. HA! As if she’s going to get away with paying me for one of those after she’s spent at least 12 hours watching my children over the last month. So – I made one for her. Pattern is Econo-Shopper Mesh Bag (free online); I made the large size using a J hook and some Sugar n’ Cream in Cornflower. She liked it! I hope it holds up as well as mine has. I made a scarf today! This entry was posted in Finished. Oooo! Crocheted handles–of COURSE! 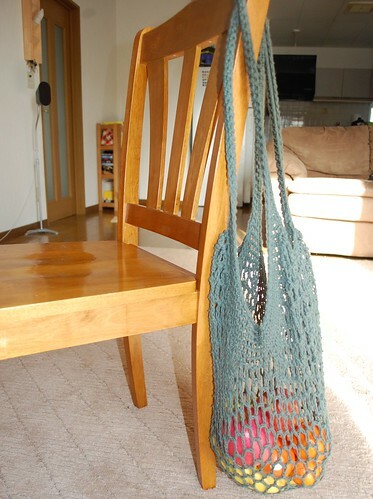 I’ve made a knit bag like this one, but the handles are always too stretchy. But if I crocheted them–duh! Yes, I have them hanging differently.